Amber Cobb curated works by Debra Sanders and Lucas McMahon in the group exhibition, “Significance of the Void” at Pirate Contemporary Art alongside photography, paintings and sculptures by Jason Garcia, Blanca Guerra and Jenna Maurice. In her own artwork Cobb often wrestles with ideas that go between the “abject and attractive.” While the works Cobb’s put together at Pirate are not abject they do deal extensively with the objecthood of beauty. Debra Sanders’ Still, 2014 uses repetition of squares and rectangles cast in glass and welded metal to confer vacancy- as Cobb’s title suggests. Sanders choice of “cold” materials, glass and metal, to recreate a home’s hearth is suggestive of what Cobb terms “loss and longing.” The empty frames is a significant reduction to what would be anti-art if not crafted so meticulously. Lucas McMahon’s Black Mirror, 2014 is a bit dour but, the cement color and brownout on the glass are rescued by the nubby texture that mimics the laciness on his Untitled paintings displayed on the other side of the gallery. 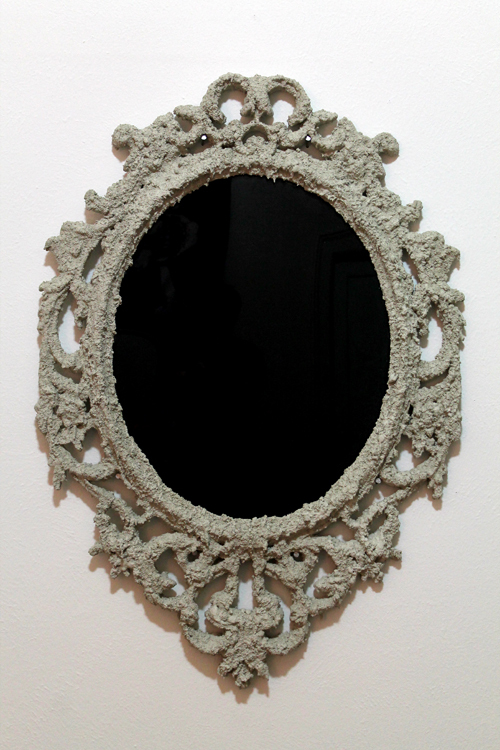 His use of cement to coat lace, his cement Headstone, 2014 exhibited alongside Black Mirror* adds up to not just a critique about the history of gender norms but also of art standards. In Headstone, the reductively heavy and empty stretcher bar made from cement reinforces the work of Debra Sanders. 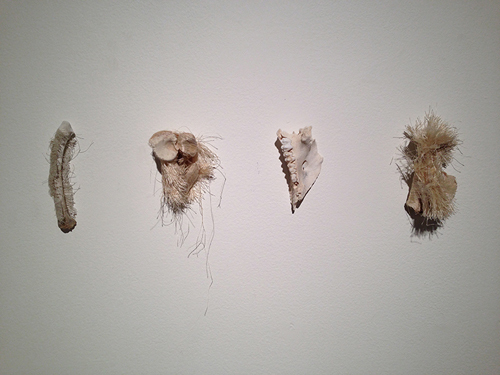 Over at Vertigo Art Space Theresa Clowes invited Sarah Wallace Scott and Gretchen Marie Schaefer to exhibit their sculpture and drawings alongside her textile work in “Attract/Retract/Attract.” Schaefer and Wallace Scott’s works both are small yet carry a seriously/ funny punch. Schaefer’s Pig’s Jaw form a Friend’s Wedding Feast and String from “Second Attempt,” 2014 is made from the collected discards of string from her laborious installation at the Biennial of the Americas in 2013 combined with yes- a pig jaw. While the four small sculptures in Wrap and Cut, 2014 use the process of covering as a method of disguise and revelation- in Pig’s Jaw the bones are draped with high gloss embroidery thread suggesting a luxurious vomiting. Yet the work is decidedly not pukish. Schaefer relies on one’s ability to transcend the association of bones with death and morbid body to ideas held within the archaeology of objects. Thingness (and time) is shown to be both retrieved and/or gone astray. Sarah Wallace Scott’s Your New Ride, 2014 made almost entirely from cast paper uses scale to great effect. The large hoof dominates the car key. 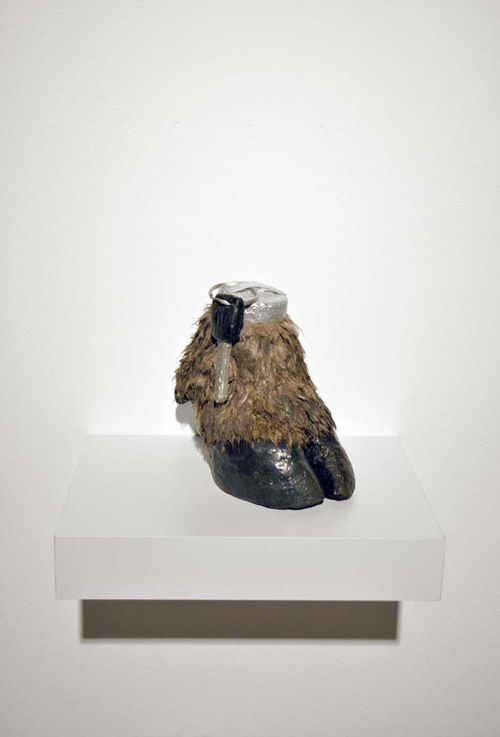 The incredibly crafted “fur” on the lopped off hoof made me believe that the ring holding the key was also paper. This emphasis on illusion and trickery makes Your New Ride even more delicious. Using a goat/sheep hoof instead of a rabbit foot Scott takes lucky charm symbology to new levels. 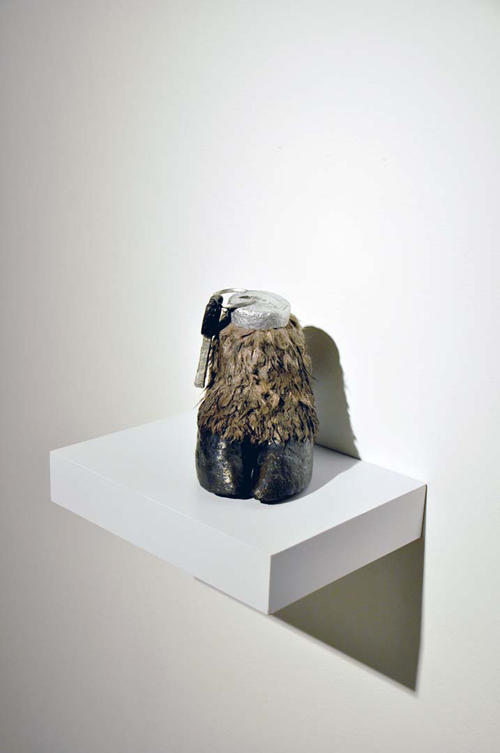 The goat/ sheep hoof is both significant in Christian and Chinese showing non-universality and incongruities between Western and Eastern ideals while poking fun at the worship of money and wealth. Check out “Significance of the Void” at Pirate Contemporary Art through Sunday, July 15th and “Attract/Retract/Attract” at Vertigo Art Space through August 2, 2014. Theresa; thank you for providing a fresh voice to the art community and public abroad. Your writing is really intuitive as well as finely articulated.